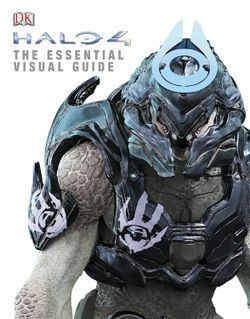 Halo 4: The Essential Visual Guide is a visual guidebook of the Halo universe. The book contains images and information on the locations, characters, creatures, vehicles, and weapons from the first installment of the Reclaimer Saga. The guide was published by Dorling Kindersley on September 16, 2013 in the US and October 1, 2013 in the UK, and respectively retail for $16.99 USD and £9.99 GBP. “ Immerse yourself in the mysterious universe of Halo 4. Read all about the Master Chief's dramatic return and explore planet Requiem and the ship Forward Unto Dawn in Halo 4: The Essential Visual Guide. Powerful characters such as the Didact and Cortana are covered in depth, while weapons, vehicles, ships and armour are showcased in spectacular detail, including cut out images and amazing in-game action. Sections on key locations and equipment are packed with fascinating facts to bring the keenest fan fully up to date with the Halo 4 phenomenon. Halo 4: The Essential Visual Guide is the perfect companion for anyone embarking on a journey in the compelling and danger-filled Halo cosmos. The book's presentation is largely similar to that of Halo: The Essential Visual Guide; the items are arranged in alphabetical order according to their most common names, although they are organized into more specific categories than in the previous guide. As in the original visual guide, each article contains an introduction, a large picture and statistics of the subject, as well as facts and trivia. In addition to the primary entries, the book also includes a glossary of in-universe terms. The Poseidon-class light carrier and Vindication-class light battleship were to be featured in Halo 4: The Essential Visual Guide but were cut due to space constraints.